As Jester explains in some detail, there is an excess of events in the graph below. The graph shows the number of events with two jets with a high transverse momentum. In the highlighted square where the invariant masses of both jets are near the top quark mass or 170 GeV, the number of events is as much as three times higher than what is predicted by the Standard Model. Although the discrepancy seems convincing in the picture above, Jester suggests that the CDF folks try to conservatively hide it by focusing on a slightly different, semileptonic events only - where a slight deficit replaces the significant excess above. 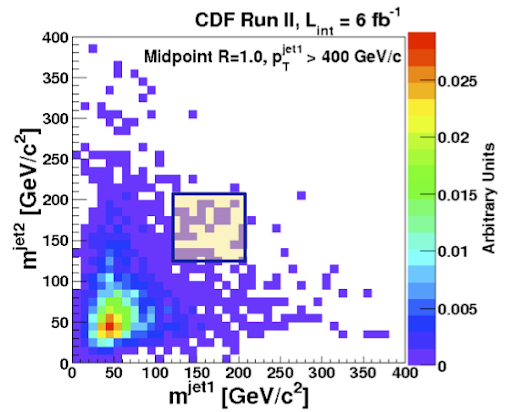 An anonymous reader points out another, 3-jet channel at the CDF that also seems to have an anomaly near the top quark mass. Matti has a relevant blog entry in which he also points out a TDG-endorsed :-) paper that describes the newest effect as an R-parity-violating decay of a light gluino.